Report on the Conference Organised by Shane Kenna, Dublin, May 16th, 2013. By John Dorney. You can read a longer article by Shane Kenna on this subject here and on the Fenian dynamite campaign here. The full title of the Conference was ‘The Irish National Invincibles and their times: perspectives on late Victorian Irish nationalism. On May 6, 1882, the newly appointed Chief Secretary for Ireland Frederick Cavendish walked backed towards his residence at the Vice Regal lodge in Dublin’s Phoenix Park. Along the way he met Henry Burke, his close colleague, the Under Secretary for Ireland. While they had not known each other for long, they anticipated working closely together in the years ahead. Neither man made it to their destination. They were ambushed on the way by a squad of men from the militant Fenian grouping, ‘The Invincibles’ and hacked and stabbed to death with surgical knives. 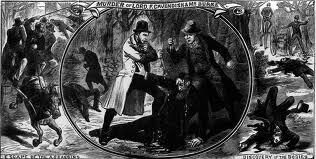 It was the brutal and most high profile assassination of the Victorian era. Who were the Invincibles and where did they come from? How could they contemplate such a brutal act? This conference organised by historian Shane Kenna, in Dublin on May 16, 2013 was an attempt to answer these questions. The Phoenix Park murders took place against the background (sketched at the conference by Frank Callan and Felix Larkin) of the Land War – a period of intense civil strife in rural Ireland. In 1879 a slump in agricultural prices and a poor harvest had put thousands of small farmers at the risk of eviction, due to not being able to pay their rent, either in cash or in kind, to their landlords. This raised the prospect of mass evictions and even starvation as had occurred in the bitter famine winter of 1847. The Phoenix Park murders took place against the background of the Land War – a period of intense civil strife in rural Ireland. Encouraged by Fenian activist Michael Davitt and constitutional nationalist Charles Stewart Parnell, tenant farmers organised in the Irish National Land League to withhold rents and resist evictions. There also followed a widespread campaign of sabotage, burning hayricks, maiming cattle, intimidating and on occasion even killing rent-collectors, ‘land-grabbers’ and landlords. The British state in Ireland responded with the Coercion Bill, which allowed for detention without trial. The Land War was at once a social and national conflict. The landlord class, though not exclusively Protestant, was largely so, was Anglo-Irish in culture and had for two hundred years been the backbone of British rule in Ireland. At the time of the Phoenix Park murders, Parnell and other Land League leaders were imprisoned under Coercion, but had just concluded a deal, known as the Kilmainham Treaty, to call for an end to violent agitation and to participate in Land Courts to set fair rent. The Chief Secretary for Ireland, Forster, resigned in protest at this concession to ‘outrage’. His successor was Frederick Cavendish, who on his first day in the job, met his gruesome death at the hands of the Invincibles. The Invincibles, apparently, Shane Kenna told the conference, with the connivance of elements of the Land League, had concocted a plot to assassinate senior figures in the Irish administration in retaliation for imposition of Coercion. The day before the killings, two young bandsmen were killed by the Royal Irish Constabulary at a riot in Ballina. The Invincibles had wanted to kill the Under Secretary, Henry Burke, who, Kenna informed the audience, was a Catholic and moderate nationalist but who was a dedicated servant of the Crown and popularly associated with Coercion. Cavendish, the newly appointed Chief Secretary was simply unlucky that he met Burke on his way home and was killed to eliminate a witness. The Irish National Invincibles was a secret society set up within the Irish Republican Brotherhood, or Fenian, network with a policy of assassination. They were not, Kenna emphasises, a breakaway or an off-shoot of the IRB, as is often stated. Though the Irish Fenian leadership under John O’Leary actually disapproved of their tactics, the Invincibles had the backing of the American Clan na Gael. Five Invincibles were hanged for the Phoenix Park killings, some gruesomely, decapitated and their bodies used for medical science. Their leader was James Carey, who set up a ring of assassins in Dublin and smuggled the weapons, surgical knives (used apparently for quiet killing), in from England. However, Carey, picked up in roundup of Fenian activists by Dublin Metropolitan Police head of detectives John Mallon, broke under interrogation and gave away his co-conspirators. Five of them were hanged, some gruesomely, decapitated and their bodies used for medical science. James Carey himself was given a false identity and sent to start a new life in South Africa. But when an Irish fellow passenger, O’Donnell discovered his identity, he shot Carey dead – an indication that despite the shock and outrage at the Phoenix Park killings, the informer was, in the 1880s a figure of revulsion in Ireland. O’Donnell was in turn brought back to Ireland and hanged, bringing the total of people who died in the assassinations and the fallout from them up to 9. Myles Dungan, in an examination of the contemporary nationalist press, showed how the United Ireland newspaper, a militant supporter of the Land League, was temporarily shocked into the condemning the killings unreservedly. However, as if to make up for it, it soon returned to excoriating the British administration for Coercion, arrests, packing juries and the rest of the methods used to try to put down both Fenian societies and the Land League – a clear sign of how in polarised situations people can dehumanise the deaths of their ‘enemies’ given half a chance. The same is quite clearly true also on the British side however. Little concern was given to the lives of the five men fingered by Carey for the assassinations, whose bodies were not even returned to their families after their execution. The Phoenix Park killings as we heard at the conference, were by no means the last campaign of political violence by Fenian groups in the late 19th century. Even before the Phoenix Park murders a faction in America grouped around Jeremiah O’Donovan Rossa, formed a ‘skirmishing fund’ with the intention of bombing targets in Britain itself. In 1885-86 in particular, there was a determined campaign of bombing in London, culminating in ‘dynamite Saturday’, with simultaneous explosions at the Tower of London, Whitehall and elsewhere. Although only one civilians was killed, such attacks still spread widespread fear in English cities until the perpetrators, including one Thomas Clarke – later architect of the 1916 rising -were rounded up. In the 1880s and 90s there were a number of bombing campaigns in Britain by Fenians and also a number of internecine killings in Ireland and America. Barry Kenerk (author of The Shadow of the Brotherhood on the 1867 generation of Fenians) told us of a rather inept attempt by a group under Patrick Tynan to set up an explosives factory in Belgium from which to bomb Britain in the 1890s, which rapidly came to grief due to being, from the start, penetrated by informers and double agents. Among the Fenian bombers’ enemies in the 1880s and 1890s was the Special Branch of the London Metropolitan Police, set up specifically to counter their activities and above all John Mallon of the Dublin Metropolitan Police. Martin Dew gave an interesting talk about the latter, an Irish Catholic from Maigh, South Armagh, an area known then and later for enthusiastic rebels, but who nevertheless worked unstintingly to catch republican militants. In Ireland and particularly in Dublin, it seems as if the IRB of the late 19th was torn by disunity. Michael O’Doibhilín told of an incident in 1882 whereby two rival Fenian factions – one Supreme Council backers, the other ‘Stephenites’ actually exchanged shots in the streets after a dispute over which faction controlled a cache of weapons. The only casualty however was a DMP policeman, who was shot when he tried to arrest them. One of the Fenians, Joe Poole was hanged for the incident, though probably unjustly, as he plausibly claimed he was not present at the shooting, and became for a short time a nationalist martyr held up even by Charles Stewart Parnell as an example of injustice and British tyranny. Nor was factional infighting confined to Ireland. Gillian O’Brien told the evocative story of Patrick Henry Cronin, was killed in 1889 in an internal dispute in Clan na Gael in Chicago, gruesomely lured to his death, bludgeoned to death and his body stuck into a sewer. Cronin had accused Alexander Sullivan of Clan na Gael, of embezzling the organisation’s funds but what brought about his death was his opposition to bombing campaigns in England and suspicions that he might be a British spy (though there seems to have been little evidence for this). His murder did much to discredit the American Fenian network. Shane Kenna was written elsewhere that the Fenians of the late 19th century did much to pioneer, ‘terrorism’ as we know it today – selected sustained attacks on high profile targets, designed not so much to further military aims as to inflict psychological damage and fear upon a political enemy. For all that, it struck me how ineffective much Fenian political violence of the late 19th century was. What for instance did the Phoenix Park killings achieve except to provoke another Coercion Act? The Fenian bombing campaigns of the 1880s did not bring Irish independence a step closer, but it did encourage those elements in British society who wished to see Irish people as ape-like terrorists. And even more tragic and futile seem the internecine killings that occasionally occurred – the all but inevitable consequence of keeping an armed clandestine organisation in existence over a long period of time. Even many Fenians – notably John O’Leary in Ireland – intensely disliked small group violence of this kind. And in fact the IRB’s 1879 constitution stated that armed methods would not be pursued again without the backing of the majority of the Irish people. This distaste for political violence comes easily to this reviewer, not only because of the contemporary ‘War on Terror’ but also the memory of the last years of the Northern Ireland conflict – a reflex that it is as well to acknowledge openly. Nevertheless, the review cannot close without considering what it is that drives people to the use of such methods. In the case of the Fenians of the late 19th century – and no doubt for many armed militants today – it seems to have been essentially a sense of powerlessness. The British state in Ireland – ruled by a small appointed clique in Dublin Castle – appeared omnipotent. It seemed to back up a manifestly unjust economic and social system on the land – the Great Famine was still within living memory – and it was prepared to suspend its own laws via Coercion to defend itself. The Fenian Invincibles and ‘dynamitards’ seem to have reached the conclusion that the powerless could only strike the powerful where they themselves were weak – in unarmed and civilian targets. Their victims were in fact relatively few, but their logic retains its grim plausibility. You can listen to Shane Kenna talking about these themes here. Written by: John_Dorney on 29 May, 2013.on 1 September, 2013. 2 Responses to "‘The Irish National Invincibles, The Phoenix Park Killings and their Times.’"
I don’t believe they caught all of the people convicted in the Phoenix Park Murders. My grandmother on her deathbed wrote a letter claiming that her father took part in these murders and had to change his name because he was wanted in Ireland. I don’t believe the letter to be a hoax because she was a good Catholic and she was dying of cancer at the time.